By way of explaining his eight failed marriages, the American bandleader Artie Shaw once remarked, “I am an incurable optimist.” Utterly devoid of self-awareness, he never looked back, only forward. So, too, with the incurable optimists who manage present-day American wars. What matters is not past mistakes but future opportunities. This describes the view of General Joseph Votel, current head of US Central Command (CENTCOM). Since its creation in 1983, CENTCOM has emerged as the ne plus ultra of the Pentagon’s several regional commands, the place where the action is always hot and heavy. Votel is the latest in a long train of four-star generals to preside over that action. One imagines that there must be another Department of Defense Dictionary, kept under lock-and-key in the Pentagon, that dispenses with the bland language and penchant for deceptive euphemisms. That dictionary would define an AOR as “a vast expanse within which the United States seeks to impose order without exercising sovereignty.” An AOR combines aspects of colony, protectorate, and contested imperial frontier. In that sense, the term represents the latest incarnation of the informal empire that American elites have pursued in various forms ever since US forces “liberated” Cuba in 1898. “In the wake of 9-11, the international community found Saddam Hussein’s continued lack of cooperation with United Nations Security Council (UNSC) Resolutions regarding weapons of mass destruction unacceptable. Hussein’s continued recalcitrance led the UNSC to authorize the use of force by a US-led coalition. Operation Iraqi Freedom began 19 March 2003. More to the point, to claim that, in the years since, CENTCOM “has continued to provide security to the new freely-elected governments” of Afghanistan and Iraq whitewashes history in ways that would cause the most shameless purveyor of alt-facts on Fox News to blush. 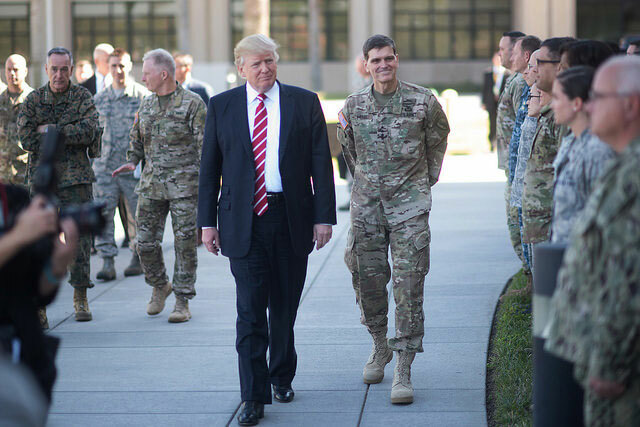 The incontestable truth is that Afghans and Iraqis have not known security since US forces, under the direction of General Votel’s various predecessors, arrived on the scene. Rather than providing security, CENTCOM has undermined it. Earlier this month, Votel provided a progress report to the Senate Armed Services Committee and outlined his expectations for future success. In a city that now competes for the title of Comedy Central, few paid serious attention to what the CENTCOM commander had to say. Yet his presentation was, in its own way, emblematic of how, in the Age of Trump, US national security policy has become fully divorced from reality. General Votel began by inventorying the various “drivers of instability” afflicting his AOR. That list, unsurprisingly enough, turned out to be a long one, including ethnic and sectarian divisions, economic underdevelopment, an absence of opportunity for young people “susceptible to unrest [and] radical ideologies,” civil wars, humanitarian crises, large refugee populations, and “competition among outside actors, including Russia and China, seeking to promote their interests and supplant US influence in the region.” Not qualifying for mention as destabilizing factors, however, were the presence and activities of US military forces, their footprint dwarfing that of Russia and China. Of course, US military commanders today don’t make crude references to punching holes. They employ language that suggests discrimination, deliberation, precision, and control as the qualities that define the American way of war. They steer clear of using terms like attrition. Yet differences in vocabulary notwithstanding, the US military’s present-day MO bears a considerable resemblance to the approach that Ludendorff took fully a century ago. And for the last decade and a half, US forces operating in the CENTCOM AOR have been no more successful than were German forces on the Western Front in achieving the purposes that ostensibly made war necessary. Andrew Bacevich, a TomDispatch regular, is the author of America’s War for the Greater Middle East: A Military History, published by Random House.